Hello! 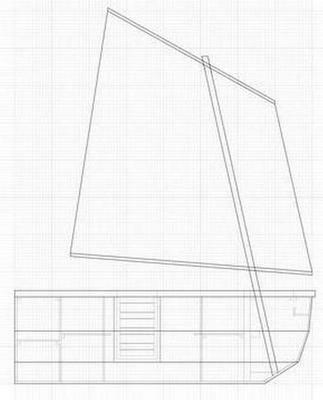 Lately I have been working on a design for a 8' sailing digney and I would like some advice before I go any further. I wanted to make a small boat that was stable, comfortable to sit in, sail and drift. It has four storage spots: one in behind the back bench, an open one under that bench, and two closed ones in the front with the last one having a slot for the mast of a balanced lug sail. My first picture has two cross section pictures at the beam of the boat, the bottom of which was my original idea for the shape of my boat. However, I think that its round shape would make the boat tip too much and make it unstable. 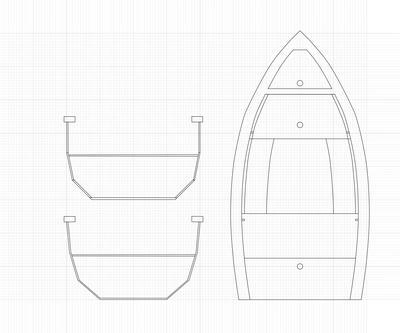 I designed the seats to be wide enough to hold 2-3 people on the back bench and 1-2 on the front, so the boat has to be stable enough for them to get in. 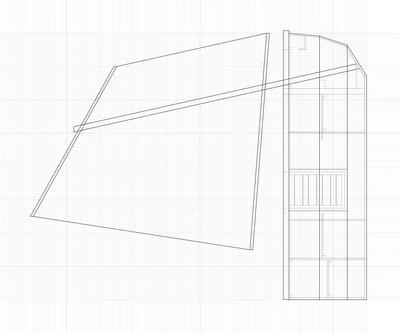 Should I change to hull shape to be closer to that of the top cross section or is there a better shape? There needs to be roughly enough foot space for all those people. I also decided to use 3/4 inch plywood for the bottom three panels and the back of the boat, with the other panels being 1/2 plywood. Is that a good selection? Those are what I mainly need advice on, but any other critique would be greatly appreciated. It’s a good start but perhaps needs more tinkering. I assume you are going to add a rudder and some form of lifting keel or daggerboard. Could the stern and bow seating be placed over the storage areas to save room? A center thwart could then be added that would help with weight distribution and help support a daggerboard case. Too many people sat at the stern will result in her ‘squatting’ bows up. I like the Balanced lug, perhaps some arrangement could be made to the mast step so the ‘rake’ can be adjusted. As for the plywood sizes, ½ inch would be more than enough all around but ¼ inch for the sides would be easier to bend. and tested’ plans here for ideas. It doesn't look like much room is left for sitting. I would find some free plans online somewhere for a punt of some sort. Something proven.